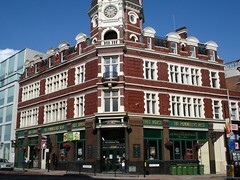 Decent enough Wetherspoons pub on the corner of Tooley Street and Tower Bridge Road. Like most Wetherspoons, food served all day. I had the chicken, ham, and leek pie (£6.59), which unlike most pub pies actually had pastry all the way round, rather than just being a stew in a bowl with a piece of puff pastry balanced on top. It was a bit burnt on top, though, and there wasn't nearly enough gravy with it. The chips and peas also weren't anything special. Overall, it wasn't inedible, but certainly nothing I'd specifically try again, and I do think it was overpriced for the (lack of) quality. Real ale served; I had a pint of Manchester Rambler at £1.79 (March 2007). I was last here 3-4pm on a Tuesday; normally a dead time for most pubs, but it was still fairly lively. Admittedly, mostly older people, and mostly men, but it was still nice to hear the buzz of conversation (there wasn't any music). I generally find the service here is rather slow, to the point where you find yourself wondering how it could possibly have taken the barman that long to serve someone a couple of pints, but it's friendly enough. The 2007 Good Beer Guide suggests this place has wireless internet, but I'm not sure if it's free, or indeed if it works. --Kake, March 2007. Last visited by Kake, March 2007. Opening hours taken from Wetherspoons website, May 2008. Last edited 2017-01-09 19:23:58 (version 17; diff). List all versions. Page last edited 2017-01-09 19:23:58 (version 17).